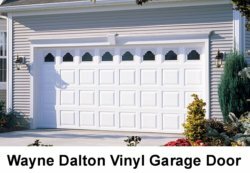 Vinyl garage doors are a relative newcomer to the market, and they have a lot of advantages to offer. Like steel, aluminum and fiberglass doors, they are relatively maintenance free, and their durability is at the top of the heap so to speak. They can be found in several different styles, and are a great choice for a lot of homes. Vinyl is a type of plastic that is flexible, weatherproof and strong. Because it is flexible, vinyl doors are always built with a metal frame that is made of either steel or aluminum. Almost all vinyl doors are insulated, and some have a steel backing on the interior for added strength. Today's vinyl is usually a solid color all the way through, and it will last virtually forever. Vinyl garage doors have several advantages over metal. They will not rust, so they are a great choice in coastal areas where they will be exposed to salty air. Because most vinyl is the same color all the way through, it will not show scratches like an aluminum or steel garage door will. There is no paint to peel off. They also will not dent like aluminum or steel will, which makes a vinyl door very kid-friendly. Vinyl does not transmit noise as easily as metal, either, so they are quieter in operation, and will muffle outside noise somewhat. Vinyl does not require painting or staining like wood does, and it is not affected by moisture or insects. It can be embossed with a textured wood grain pattern, and the best quality vinyl doors are quite realistic-looking. Vinyl doors do have some drawbacks, though. Generally speaking, they are more expensive than comparable steel models. They can get brittle with age and/or in extremely cold weather, so the outer panels can split from a sharp impact. They can also fade or get a chalky appearance after years of exposure to direct sunlight. However, these drawbacks are not as much of an issue with the better-quality models made today, and many are warranted against these problems. Another disadvantage relates to color. Dark colors absorb more heat from the sun, and vinyl expands when heated. For this reason, vinyl is usually only available in a limited selection of light colors. It is not easily painted, and requires a special kind of paint that may be hard to match to the rest of your home if you want to change the color at a later date. Painting will almost always void the manufacturer's warranty. Because vinyl is a relatively new door material, not all manufacturers offer it. You can find almost any basic style you want, but there are not nearly as many options as there are in steel, wood or aluminum. A wood grain vinyl door typically does not look as realistic as a wood grain steel door, especially on lower-end models. Despite the drawbacks, vinyl doors are gaining in popularity. No other type of door offers the same combination of durability, corrosion resistance, and impact resistance. If you can live with the limited color choices and don't live in a climate with extreme cold, a vinyl garage door may be the last one you ever have to buy. To learn more about other door materials, take a look at the menu of our Related Pages for information on other types.